Summer is here and enjoying ripe summer fruits and veggies is one of the best ways for seniors to get essential vitamins and nutrients, improve metabolism, boost the immune system, and promote good energy levels. Help your senior loved one stock up on nutritious “good calories” by serving these succulent summertime foods – favorites here at Home Care Assistance of Harrisburg. Corn – While processed corn can add unwanted empty calories to your diet, fresh summer corn on the cob is packed with health benefits, including two powerful antioxidants, lutein and zeaxanthin. These nutrients are crucial in developing and protecting the macular pigment in the eyes that help to filter out harmful sunlight and prevent early blindness. Iced Coffee – An iced coffee drink is a rewarding pick-me-up treat on hot days, and some studies have shown that coffee may even have the power to guard against cancer. In one study of more than 93,000 women, scientists found that a cup of coffee per day could lower the risk of skin cancer by as much as ten percent. Tomatoes –These delicious summer vegetables are a great source of lycopene, which can help protect the skin from harmful rays and reduce skin reddening. Some studies have proven that the natural lycopene from real tomatoes is more effective than lycopene supplements. 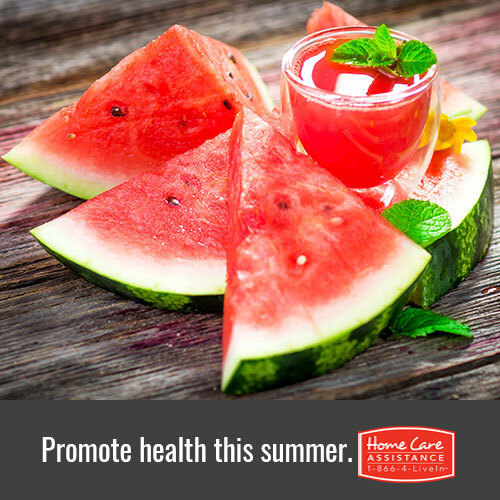 Watermelon – Summer is an especially important time to stay hydrated. As well as drinking water, your loved one can also stay hydrated by eating the right kinds of food. Aptly named, refreshing watermelons and can be up to 92% water which is great for keeping seniors hydrated. As a bonus, foods like watermelon that have a high water content also tend to have a low calorie content, meaning your loved one may feel fuller and more satisfied. Including plenty of colorful summer variety in your loved one’s diet is one of the best ways to promote senior health! To learn more about summer activities, senior nutrition, or in-home help for your senior loved one, call (717) 540-4663. A Care Manager from Home Care Assistance is more than happy to answer your questions and can provide you with information about hourly and live-in senior home care in Harrisburg.